Regina, SK. — With any championship team, those who contributed to the trophy-winning moment aren’t confined to just those on the ice. It takes trainers, the coaching staff, stick boys and those on the business operations side. 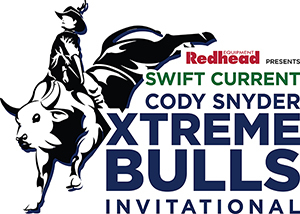 In the case of the Swift Current Broncos, the entire community played a part in raising the Ed Chynoweth Cup for the third time since their arrival in 1986. So when the final buzzer sounded on Game Six of the 2018 Rogers WHL Championship Series, it wasn’t a surprise that fans stuck around, not just to see Glenn Gawdin, their beloved captain, receive the 2018 WHL Playoffs Most Valuable Player Award and the Ed Chynoweth Cup, but just to watch the entire celebration and soak in the moment. It took the Broncos 26 games to reach that championship moment this season, but for a team that craves annual success, it was a quarter-century in the making. Through the ups and downs of the first three rounds and dropping key games on home ice, the casual observer may have swayed. When it came to the those who wore the team colours proudly, the Broncos faithful never wavered in their support, feeling things were much different than they had been in 2017 and 2001. Instead, they felt like things resembled 1989 and 1993. The names of Krywulak, Girard, McAmmond, Tisdale and Lambert had etched their name among a long list of heroes in the hockey-centric community. Now, the likes of Gawdin, Skinner, and Estephan among 2018’s talented cast were joining them. A community that had been tested on December 30, 1986 in a horrific bus crash, grew stronger through their team. As go the Broncos, so to does the town. Easily the hottest ticket in town, the support can be seen in shop windows around town as local businesses fly their team’s flag. Once the puck drops, if you’re not paying attention in the arena, through the webcast or on the radio, you’re missing out. “It’s electrifying; it’s exciting,” said Broncos forward Giorgio Estephan, who had been the opposing side of the fans until a January trade brought him to the Saskatchewan community along the Trans-Canada Highway and immersed himself in their rich history. 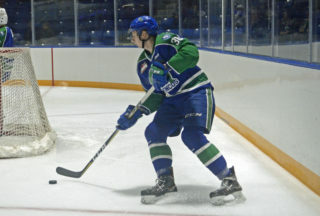 While the Broncos loaded up throughout the season, adding players like Matteo Gennaro, Stuart Skinner, Estephan and Josh Anderson to compliment a roster that already had the likes of Gawdin, Tyler Steenbergen, Aleksi Heponiemi and Colby Sissons among others, there was no guarantee of making it to the Rogers WHL Championship Series. The East Division had been competitive all year, with the formidable Moose Jaw Warriors and Mastercard Memorial Cup host Regina Pats standing in their way. While the season series may have indicated that the Broncos weren’t going to have any problems with the Pats, the series still went seven games with some tumultuous results during both home and away games. Taking on the Moose Jaw Warriors, the Broncos excelled on the road, thanks in large part to Skinner’s three straight shutouts at Mosaic Place in Game Two, Five and Seven. From the letdown of a triple overtime thriller at home to the battle fans and media were keeping their focus on, the Broncos faithful were there for it all, clanging their cowbells along the way. “Every time they’re chanting my name, it gives me so much excitement, so much adrenaline,” said Skinner. “They’re a huge reason why we won the whole thing. 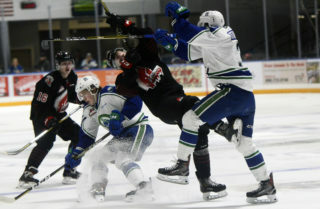 The passion of the game consumes all 22 markets in the Western Hockey League from Brandon to Vancouver Island and the Pacific Northwest. Things feel different once you arrive in Swift Current though. For every person in town and the surrounding communities, each has a vested interest in the moves of the Broncos, however minor. When the Broncos were preparing to play host to the second leg of the 2017 CIBC Canada Russia Series last November, Viveiros said even a routine trip to the coffee shop would result in opinions, whether they were solicited or not, about the team’s recent performance. If the Broncos were winning, it was about what they could be doing better to keep the good times rolling. If they were in a bit of a slide, the attention shifted to figuring out how to get back in the win column and which of their favourite players would be most responsible for that turnaround. 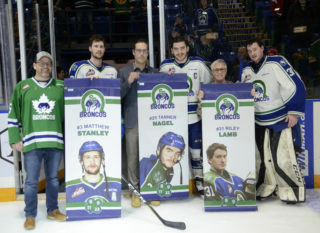 Even as the importance of each game was amplified during the Eastern Conference Championship against the Lethbridge Hurricanes and WHL Championship against the Everett Silvertips, the fans kept delivering for the team as the team delivered for them. Winning a WHL Championship was a career highlight for Gawdin and the town of Swift Current. With a chance to deliver a Memorial Cup to the town that has stood side-by-side with their team for so long would be an immeasurable feat in the career of most and a memory the team’s fans would keep with them forever. 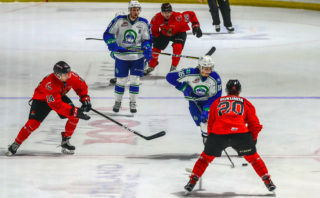 Whether they end up claiming the Memorial Cup or not, the town of Swift Current has left a positive impression on captain Glenn Gawdin. The fans have shown up for the Broncos at the 2018 Mastercard Memorial Cup in Regina too, introducing a national audience to the power of their cowbells. You can bet that they’ll be out in full force for Wednesday’s round-robin finale as the Pats and Broncos meet once again. It’ll be the first all-Saskatchewan meeting at the Memorial Cup since the Broncos defeated the Blades on May 13, 1989 to win their first and only Memorial Cup to date. 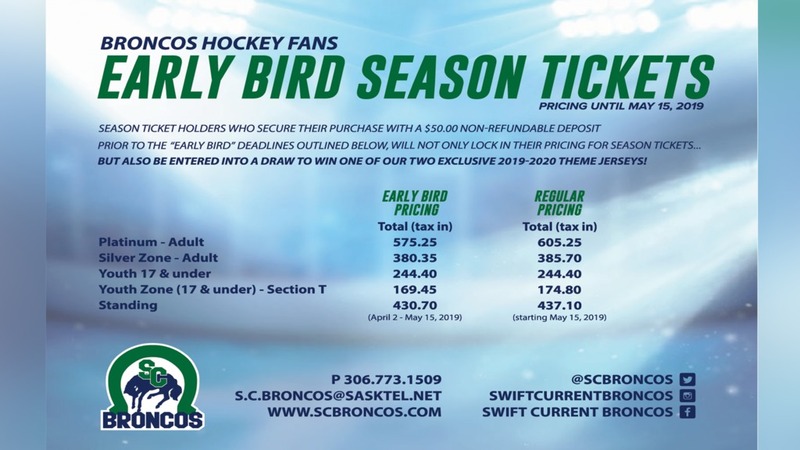 For the 0-2 Broncos and their travelling supporters, they’re hoping for a victory to extend their season, which would feature another potential tie-breaking game against the Pats Thursday night as well. Fans of WHL hockey would gladly take a double dose of the two teams battling for their season and a shot at lifting the trophy come Sunday. When their season does come to a close and the players depart for another offseason, some bound for the professional ranks and school, others will return to play for the Broncos, eager to keep lighting the flame of passion lit inside each fan at the Innovation Credit Union i-Plex.